Michigan man Andre Poineau was photographed seemingly walking on water near his home, along the shores of Lake Charlevoix. 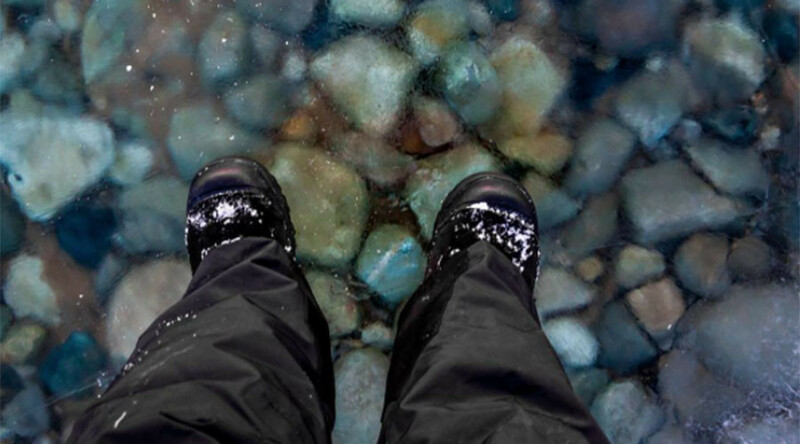 The photo of Poineau standing on the surface of the crystal-clear lake has gone viral. On Saturday, following a freezing night, Mr Poineau awoke to find the lake, located near Boyne City, to be oddly clear. Naturally he went down to the shore to inspect it, bringing with him a shovel to test how deep the ice was. He found it to be about 2 inches thick, National Geographic reports. In his first Facebook post in almost two years, the not-so-avid social media user is amused by the attention the photos have received, as for him the phenomenon is not so unusual. Poineau has experienced such an occurrence at least half a dozen times, and he has lived on the lake his entire life. The picture has been shared across social media, notably on the Facebook page of Physics-Astronomy.com, where it has been shared almost 70,000 times, generating over 2,000 comments. This is not the first time the phenomenon has been documented. In 2014, a video of two friends walking on a clear lake in the Slovakian mountains went viral, being viewed over 9.6 million times.